The incident was a stark reminder of the fragility of parts of Istanbul's residential infrastructure, with several buildings collapsing in recent years. It had 14 apartments with 43 registered residents. That warning was made on the anniversary of the August 17, 1999, magnitude-7.4 quake that killed more than 17,000 people in northwestern Turkey. It said 13 others, including a five-year-old girl, were injured. There were reports of multiple people left wounded or trapped under the rubble. However, Mr Kurum told reporters that some apartments had guests at the time of the collapse, without providing details. The girl, Havva Tekgoz, was carried to a waiting ambulance on a stretcher as one person in a crowd of onlookers chanted "God is great!" A nine-year-old boy was also rescued. At least one fatality has been recorded, while three of at least four people known to be trapped have been rescued. 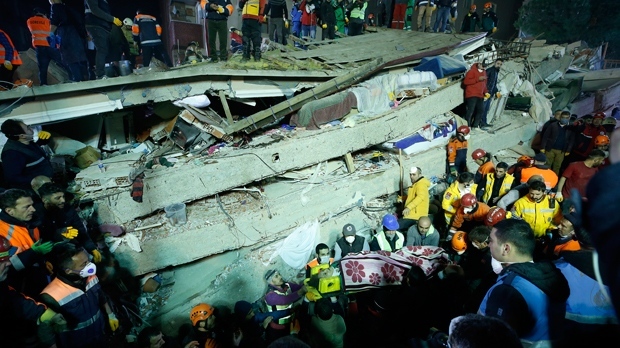 Yerlikaya urged people to vacate the scene to let rescuers operate more effectively. The death toll from the collapse of an eight-storey apartment building in Istanbul has risen to three, the Istanbul governor's office announced on Thursday. At least three people were killed when a seven-story building on Istanbul's Asian side collapsed, authorities said Wednesday. Teams are now working on the 4th floor of the building, he said, adding efforts are going on by considering the risk of collapse of the adjacent building.